This night before wedding cake was a crazy cake. I made two different cakes. The first was 6" with four levels chocolate with champagne buttercream and strawberries. I covered it with champagne buttercream, and make some chocolate strips to go up and down on it. I made chocolate clay people with their faces made out of icing imaging. I made a swing set out of dowel rods and chocolate. The theme was where he purposed to her. which was at UT college and on the playground, on the swingset. The large square cake was 1/2 champagne and 1/2 chocolate. The filling was cheesecake buttercream and strawberries, and on the chocolate side, I added chocolate granche to it. I covered it in butter cream, then applied white marshmallow fondant and made a draping to go around the sides which I indented with a roller. 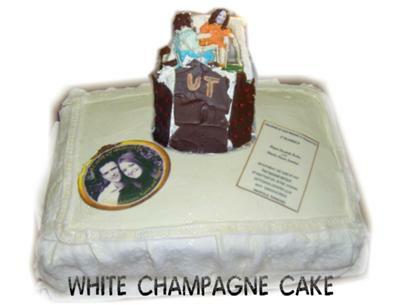 I added their picture and invite out of an icing sheet, the added pearl dust to finish it.